Suzanna hosts and teaches workshops throughout the year. Check this page regularly to see what's coming! July 2019, Suzanna brings Gyongyi Stuber of Hungary to Seattle for workshops and shows, and her first ever USA visit! Beyond being multi award winning and relentlessly talented, Gyongyi continues to stretch her dance as a discipline and universal form of art and expression. From folkloric to classical Egyptian to cabaret and fusion, she defies all categories. She's also refreshingly humble, encouraging, and genuinely in love with sharing the joy of dance. "Suzanna works her tail off and is very encouraging to her students -- doesn't matter if it's one or a dozen. She's creative and makes the tough work fun... and sensitive when working with people with some physical challenges. She's had some great training with some of the best in the world and is generous about sharing what she knows. I saw a quantitative improvement after every class - check her out!" Arrange customized workshops for your group and location! Suzanna presents a variety of workshops. One may be just around the corner -- check the calendar! 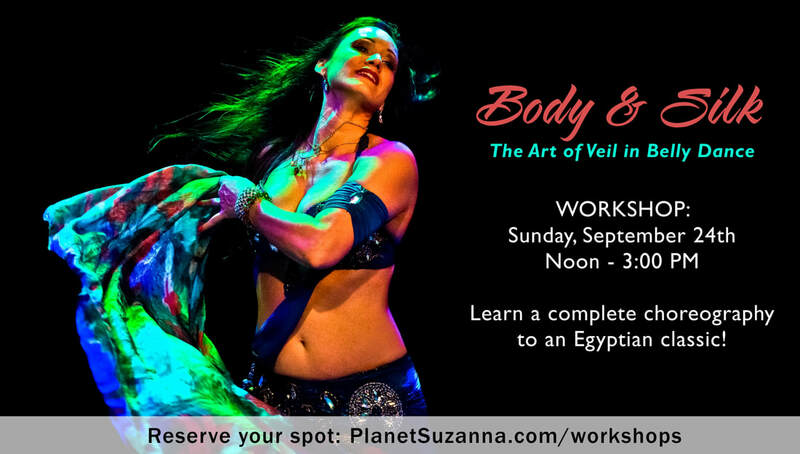 Topics include Core Egyptian Technique, Shimmy Layers, Dancing with Zills (finger cymbals), Dancing with Live Music, Musical Interpretation, Performance Power, Your Professional Dance Career, Veil, How to Choreograph, Makeup and Costume, Folkloric Styles, and more! Also, with so much incredible world dance and music talent in the Pacific NW and US, Suzanna enjoys co-teaching or hosting many exciting workshops with other dancers and musicians.